The New York Rangers have tremendous value at the backup goaltender position. With the 2017 Expansion Draft looming, we will examine Antti Raanta’s value to the Vegas Golden Knights compared to other NHL goaltenders. Antti Raanta came to the New York Rangers in the 2015 offseason filling the rather large shoes left behind by Cam Talbot. 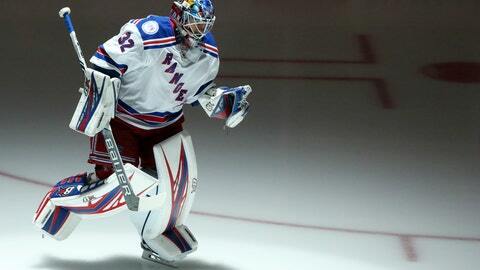 He has played admirably behind the Rangers’ franchise player and all-time wins leader Henrik Lundqvist. Lundqvist is firmly entrenched as the team’s number one goaltender, therefore leaving Raanta’s home goal crease next season in question. There is a feeling that Raanta could be one of Las Vegas’ first options to be their goal stopper in their inaugural season. Some of the other names associated with the Golden Knights expansion team include the duo in Pittsburgh, Marc-Andre Fleury and Matt Murray, as well as the Panthers’ James Reimer. Taking a dive into the numbers, it is easy to see the value that Raanta would bring to a budding, new franchise. Raanta sits in the middle of this group in terms of age at 27 years old. He is five years the elder of Matt Murray, while Reimer (28) and Fleury (32) represent older options for Vegas. Raanta’s age puts him in a position to peak at the right time for the Golden Knights, as most goaltenders hit their prime in their late-20’s and early-30’s. Raanta has also had the luxury of playing behind number-one goaltenders throughout his career. Playing in a reserve role has had multiple benefits for Raanta, including the opportunity to learn from solidified stars and limited wear and tear on his body. Although both Murray and Fleury have experienced extended Stanley Cup runs, each comes with question marks. Fleury, the oldest of the group, has been relegated to part-time starting duties and has had his mental toughness questioned many times. Murray, on the other hand, is in the midst of his first full NHL season and, at his age, could falter if relied on as a premier goaltender. Raanta’s worth to the Rangers, and possibly the Golden Knights, could be his affordable contract. Last offseason he signed a two-year extension with the Rangers worth $1-million per season. Proving another aspect of Raanta’s value moving forward for either franchise. Among the players named, Raanta’s contract has the lowest average annual value by a few million for any of the three goalies. Murray (3-years, $3.75M AAV) and Reimer (4-years, $3.4M AAV) have comparable contracts, and Fleury is signed for 2 more years for a cap hit of $5.7-million. Matt Murray may seem like the most attractive of the group at 22 years old. However, there are trials and tribulations of being a regular at the NHL level that he has not endured. Reimer and Fleury have both had a plethora of opportunities to prove their worth as well. Antti Raanta represents a proven option that could aid the Vegas Golden Knights in the immediate future and during the beginning phases of growing their franchise. If Vegas is looking for a goaltender that has shown the ability to play with some of the greatest talents in the NHL, Antti Raanta may be their option. The Rangers are well aware of the value he has, and they may lose him next summer.